In the wake of the rise of popularity in Pinkberry, there have been a whole host of new shops popping up with Pinkberry-like frozen treat. Some shops like Pinkberry sell by the cup size while others like Yogurt Lounge sells by the oz. I really like the tart flavored yogurt-like dessert that these places sell but I have a beef with the prices. I feel that Pinkberry is slightly pricey for what it is and they are incredibly stingy with their serving. C'mon weighing the cup!!!! Seriously I don't think this is necessary at all. On the other hand selling by the oz. is deceptive. At Yogurt Lounge and Yogurt World it is sold at $.38/oz. You think that's pretty cheap right? Until you see all the flavors and toppings they have. You want to try it all and the next think you know you'll be forking over more than you what you thought you would when you walked in. EHK and I have been fans of Teri Cafe for quite some time and it's first on our list when we are craving for some chicken terriyaki/katsu or ramen. Recently we noticed Yogurt Lounge open up a few doors down but didn't get around to trying it out for a while due to the cool weather. I had a conversation with JH a few weeks ago about the original tart flavor at various shops and she mentioned that I had to try Yogurt Lounge. I do like Pinkberry but at this point the closest location is still in Temecula. Why they put one up there and not smack dab in the middle of Convoy St. is something I can't fathom. Thus I don't have Pinkberry very often. A few months ago Yogurt World opened up but the first flavors were sweet flavors which I wasn't a fan of and didn't visit again until 2 weeks ago to taste the original tart which is just ok. Next to open up was Red Berry which had a nice taste but the texture was a little gritty. Personally I think Red Berry has the best deal. It's slightly cheaper than Pinkberry and you can pack on toppings on every size except for the small. 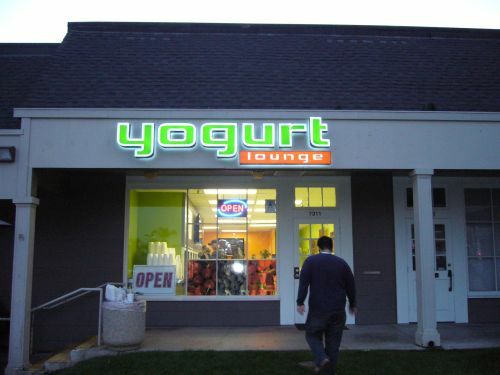 Then there was Yogurt Lounge! I really like the flavor of the original tart here- it's lightly sweetened, perhaps less sweet than Pinkberry's version. It's quite tart and very smooth. The one thing I'd change about this place is the cashier. I always see an older, not so friendly and helpful gentleman there. I'd think with such a decor that exudes youthfulness that you'd want at least a cheerful youthful looking attendant working the cashier as well. Oh well, I'm here for the frozen yogurt and not to make goggly eyes with the attendant so I'm not going to make a bid fuss. *TIP*: the frozen yogurt is a little on the runnier side so give it a short first pump before you start filling your cup and you'll be fine. It's funny, I have a friend Liz who is also a yogurt addict. I'll have to tell her about this place. My current favorite is Yogart in Hillcrest. I was actually at Yogart last week. I read the overwhelming support for this place on Yelp and had to give it a run. The decor is light and artsy. 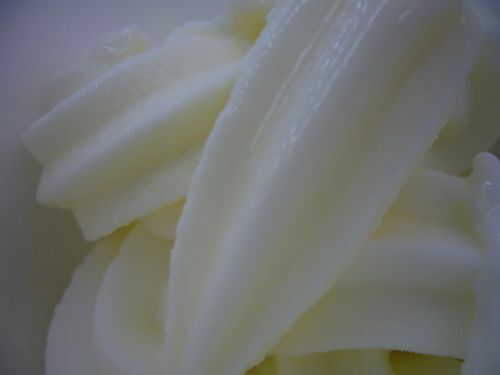 The texture of the yogurt is awesome... the best I've had. However, I think the original tart flavor is a little on the light side for me. I think if the tartness of Yogurt Lounge's yogurt can be combined with Yogart's texture it would be totally out of this world!